BOSTON (CBS) — Members of the 2016 Patriots will fondly remember their incredible comeback in Super Bowl LI for the rest of their lives. The Falcons will never forget that night, either – but more because of regret. Few members of the Falcons regret the second half of Super Bowl LI, in which the Patriots erased a 28-3 deficit before winning in overtime, more than Kyle Shanahan. Handed the keys to Atlanta’s opportunity to ice the Super Bowl, the now-former Falcons offensive coordinator instead he made an inexplicably aggressive series of play-calls that ultimately put the football back in Tom Brady’s hands with a chance to tie the game. Brady and the Patriots, of course, did not disappoint. And Shanahan was left to ponder his mistakes throughout the offseason as he works toward 2017, now the head coach of the 49ers. He spoke about his regrets from the game when he joined the Rich Eisen Show last week. He told Eisen that he regrets the call that led Trey Flowers’ late-fourth-quarter sack on Matt Ryan more than any other play. “I wish I had dialed up something differently,” said Shanahan. “And then the next play, we called an option to [Mohamed] Sanu, we got right back in field goal range, but we had a holding call on the play and it knocked us out some more, and an incompletion on the next one. 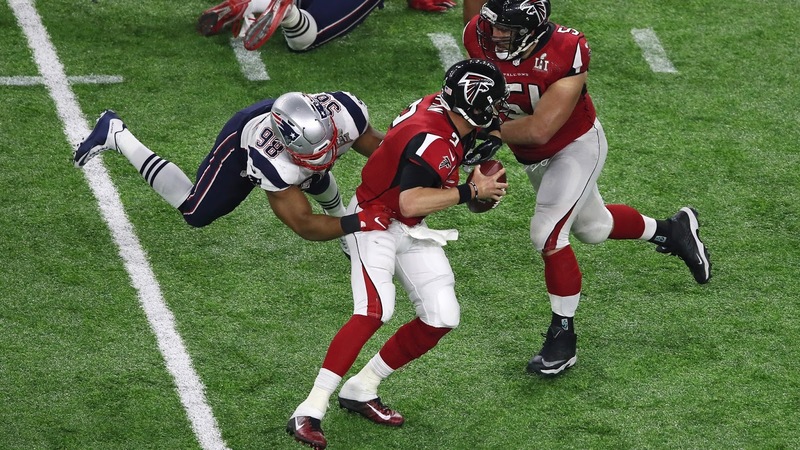 As a quick refresher: the Falcons had the ball on the Patriots’ 22-yard line up eight points with under four minutes remaining in the fourth quarter of the Super Bowl. Instead of running the ball and kicking a field goal, which would have effectively ensured victory for the Falcons, Shanahan called just one running play before sending quarterback Matt Ryan back to pass for the rest of the possession. Trey Flowers sacked him on second-and-11 (sorry Kyle, it wasn’t second-and-10) for a loss of 12 yards. It led to a holding call on the next play that put the Falcons out of field goal range, forcing them to punt the ball back to the Patriots. Dont’a Hightower came up with arguably the biggest play of the game with his fourth-quarter strip sack on Ryan, but Flowers was the team’s defensive MVP with an excellent 60-minute effort capped with the fourth-quarter sack. It should come as no surprise that Flowers’ play was the biggest source of Shanahan’s regrets. The important thing for Shanahan is that he’s learned from the experience and will play to kill the clock and kick a field goal next time he’s in a similar spot. It appears that he has, and he will.